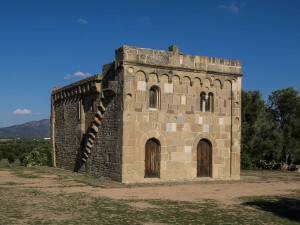 The St. Mary’s of Sibiòla church (Santa Maria di Sibiòla in Italian) is situated in a rural site a few kilometers far from Serdiàna, in the site of a now disappeared village called Sibiòla. It is one of the masterpieces of Romanesque art built in Sardinia by the Benedictine monks of St. Vittorio ‘s abbey of Marsiglia, between the end of the XI and the first years of the XII century. There is no trace of the ancient medieval village, so today the church is isolated and surrounded by modern porch enclosure used during the country feasts. The building, with a rectangular line, has modest proportions and it is built in sandstone. It is divided into two parts in two disegual aisles with two arched portals in front. Above the right portal there is a small window divided by a little column, while on the left there is a simple window. At the center of the facade, there is a stone decorated with geometric motifs colored with different materials. The other sides of the church are built with smaller stones. On the left side, there is a small staircase with steps coming out of the wall, which allows the access to the roof of the church. Along the two sides there is a horizontal series of arches. At the rear of the church, only the biggest apse has a window. Originally the church had a small bell gable on the top of the facade, which is a section of wall with an opening that housed the bell. The interior space of the church is divided into two parts by a series of four arches resting on three pillars of rectangular shape. The left side is narrower than the other. The church is covered by two barrel vaults reinforced with arches resting on pillars, or on shelves variously decorated. One of these shelves, located at the bottom left, represents an interesting decoration with two birds separated by a sacred vessel with the Tree of Life. The church is outside the village of Serdiana, at 3,6 km (2,23 miles) far from the city centre. Once in Serdiana, go through Via Roma in south-east direction, until the crossing with Via Arrocchedas. After 250 m (820 ft), turn right. After 270 m (885 ft) turn right again and then left after 230 m (754 ft). Drive about 2,3 km (1,42 miles) and turn right. After 190 m (623 ft), turn left. The church is at 50 m (164 ft) and has a big space to park cars and has a paved even car park.